BikerShield™ is a new underrun rail system launched by Safe Direction for the protection of motorcyclists from collision with guardrail barrier posts. 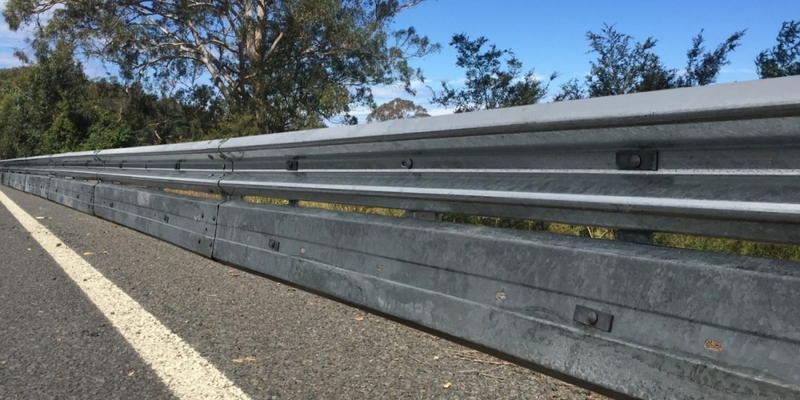 Guardrail barriers themselves must be recognised as a hazard to motorists albeit their purpose is to significantly lower the risk to the motorist from what they are being shielded from. However, the risk to motorcyclists of a rigid hazard at proximity to the edge of road such as the posts of a guardrail systems is quite acute. BikerShield™ has been demonstrated to significantly mitigate the risk to motorcyclists through compliance tests performed with instrumented dummies projected at the system at an impact speed of 60km/h. Tests were conducted with the impact point at the post as well as mid span between posts to verify performance with strict European Norm standards. Moreover, BikerSield™ has also been crash test validated to MASH to verify that the addition of it to the guardrail system does not impair the performance for vehicle impacts. Being mounted from the back of the rail via a simple bracket makes BikerShield™ significantly easier to install than post mounted systems. Such mounting always ensures the correct alignment of the BikerShield™ rail with the W-Beam rail regardless of whether the guardrail system does or does not have a spacing block on its post. Moreover, the mounting from the rail means that BikerShield™ can be installed as tested with support brackets at 2.0m centres regardless of post spacing. This means that BikerShield can also be retrofitted to existing barrier in Victoria where post spacing is at 2.5m centres without compromise to the proven crash test performance for motorcyclists. Competing systems mounted to posts are cumbersome to install; pose increased risk of a limb being snared when installed on blocked guardrail barrier due to the gap between the underside of the W-Beam and the motorcycle rail; and cannot be known to work to their design intent when installed on posts at 2.5m post spacing (unless tested at such spacing). BikerShield™ is the standout motorcycle protection underrun rail of choice, it is faster and therefore lower cost to install than post mounted systems, offers proven protection regardless of post spacing and in non-compromised whether the W-beam rail is direct to post mounted or installed on a block.